A few things pop out at me here. First the raised top plate method allows the constant overhang with the continuous fascia, overall this is more aesthetically pleasing. Second the hip rafter is no longer at the corner but is jogged in some amount onto the higher wall. Third, the higher wall actually is protruding through the sheathing of the lower pitched roof in the model. Obviously the higher wall needs to be trimmed back some to deal with this. For the plugin I think I will probably go with option 1 above initially but at some point it would be good to have a checkbox that allows one to choose either of these two options, the code is going to get ugly. I've been considering transition trusses and what it might take to add them into the plugin. 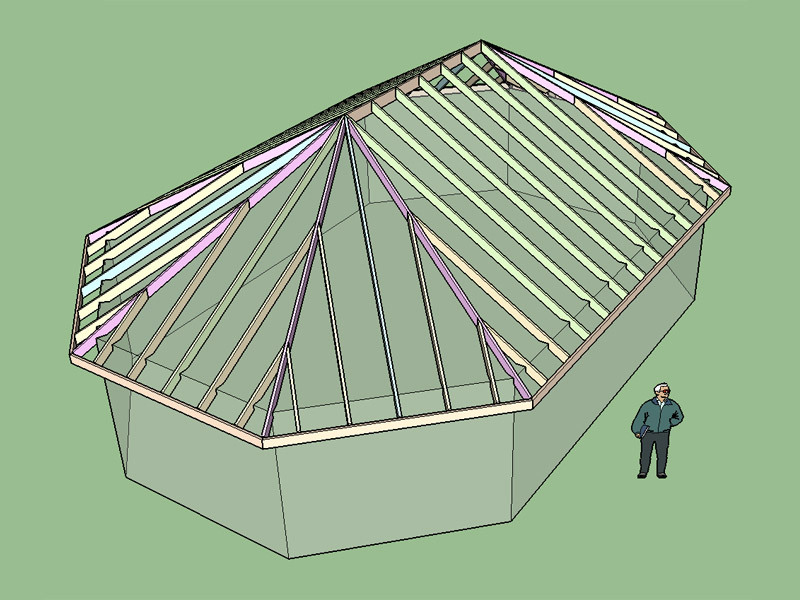 Below is a quick study of this type of roof. I am curious to know if a common truss is butted up next to a transition truss for sheathing purposes. Also notice the scissor transition, this situation is a little complicated, not exactly sure how to deal with it. Coming up on the 6 month anniversary of the plugin (April 7). I'm pretty excited with the amount of work I've been able to do on it. I would really like to get to some more big items on the list like secondary roofs and dormers but that will take a few days of uninterrupted programming which is really hard to come by at the moment. Lately, I have been addressing mostly minor items that I can knock out in a a couple of hours. I usually don't start into a big project unless I think I can complete it in one go since it is really hard to partially complete it and then try to jump back into it at a later date. The higher the complexity the more this holds true. 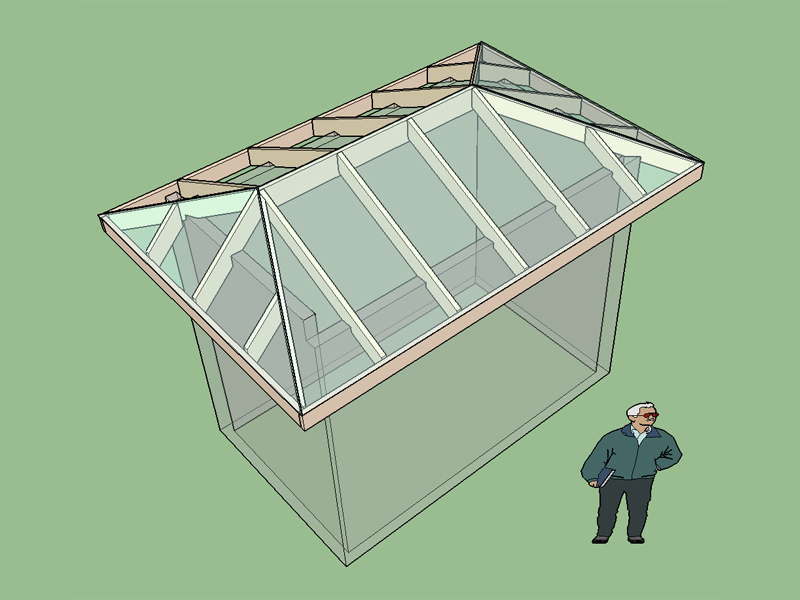 - Added Soffit Cut within Advanced Options for Gable Roof and Gable Roof w/ GLB. - Added LP Solidstart® I-joists: 450, 530, 18, 36, 56. - Rim joist option enabled for LPI floor joists. - Out-to-out span of trusses in the trial version are now limited to a range of: 16 ft. (5m) - 32 ft. (9m). Another study of hip roof framing where unequal pitches meet at the hip. The birdsmouth cut is 3.5" for all jack and common rafters. 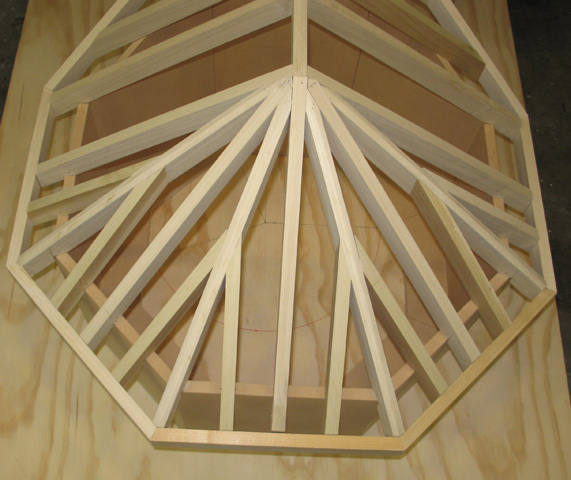 The hip rafter is dropped and off center so that it lines up with the roof planes. 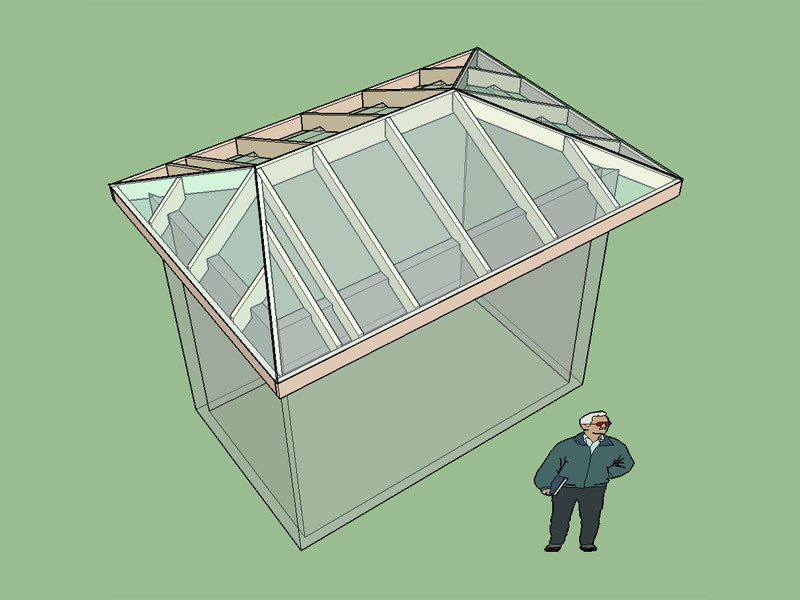 The hip roof combines a 12:12 pitch with a 6:12 pitch. This is a study of hip roof framing where unequal pitches meet at the hip (90 deg. to each other). In this case the birdsmouth cut is 3.5" for all jack and common rafters. 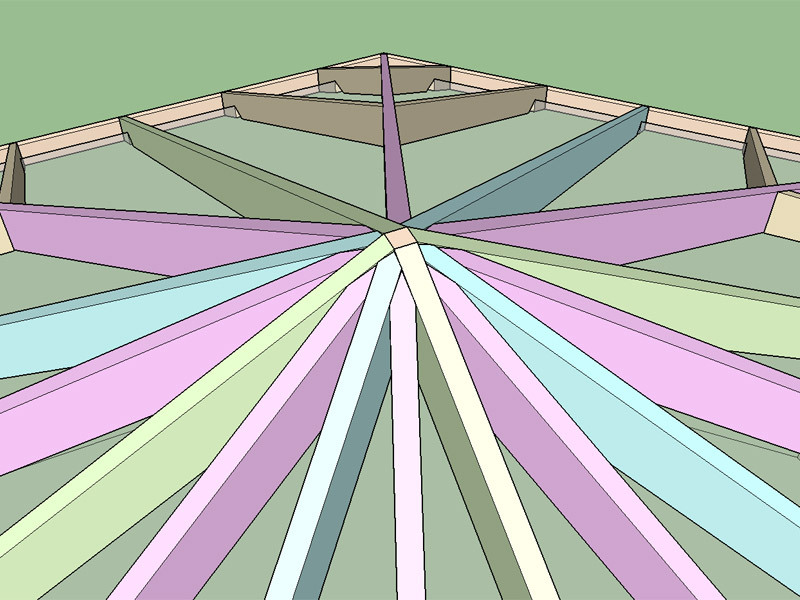 The hip rafter is dropped and off center so that it lines up with the roof planes. I assumed that the governing design criteria was that the sub-fascia line up hence the steeper pitch roof has a smaller overhang. 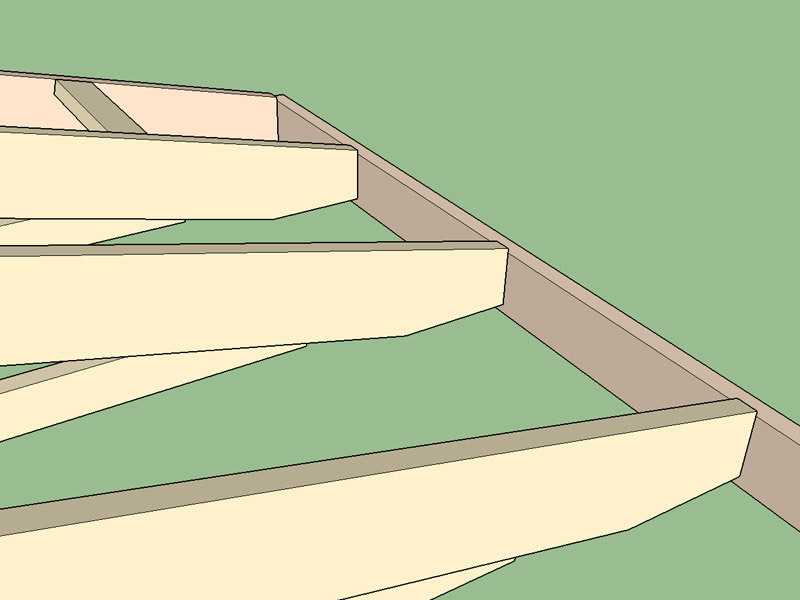 I haven't gone through and created the calculations yet for the plugin but the one thing that jumped out at me was the necessity to offset the hip rafter slightly from the hip centerline when a dropped hip rafter is employed. Please review the model and let me know if there are any problems with the way this comes together. 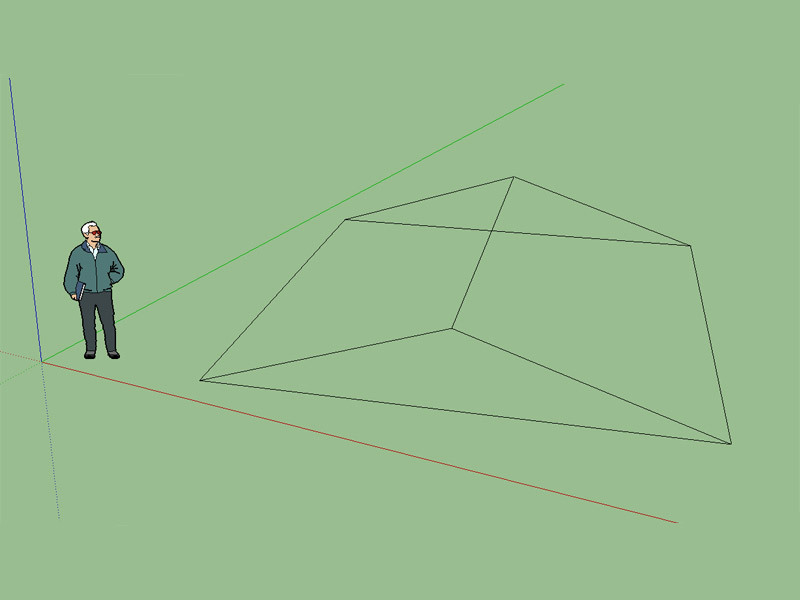 - Added wireframe (temporary) graphics to the truss positioning tool. - Added Boise Cascade BCI® I-joists: 4500, 5000, 6000, 6500, 60, 90. - Rim joist option enabled for BCI floor joists. 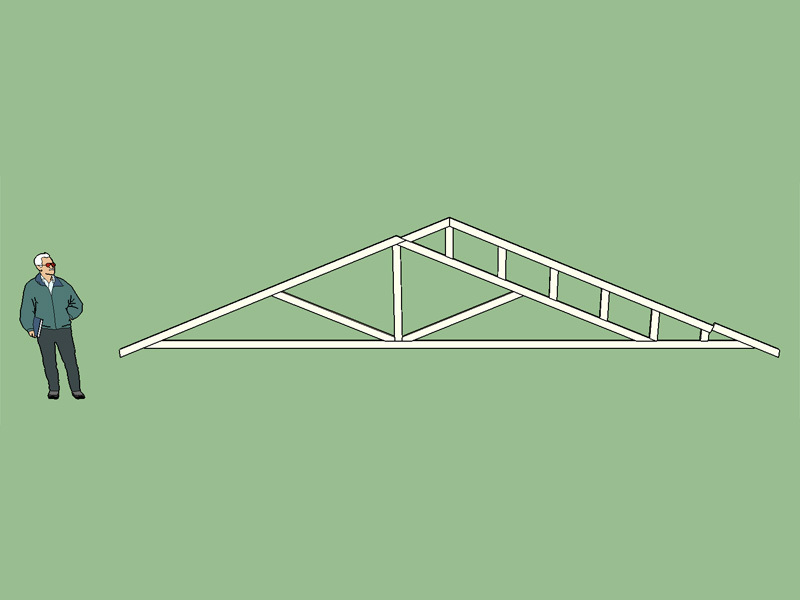 - Removed drop down list for all overhang lengths (truss & rafter roofs). Overhangs are now users inserted values. 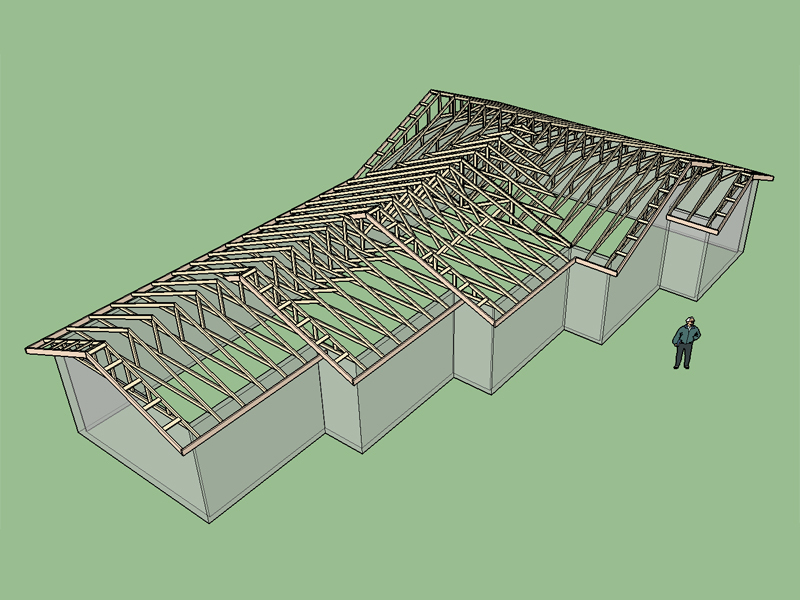 The screenshot above shows the wireframe that is displayed for common truss types. Another method would be to use an 8 faceted center block. Dewalt's framing book goes into some alternative methods in some detail. 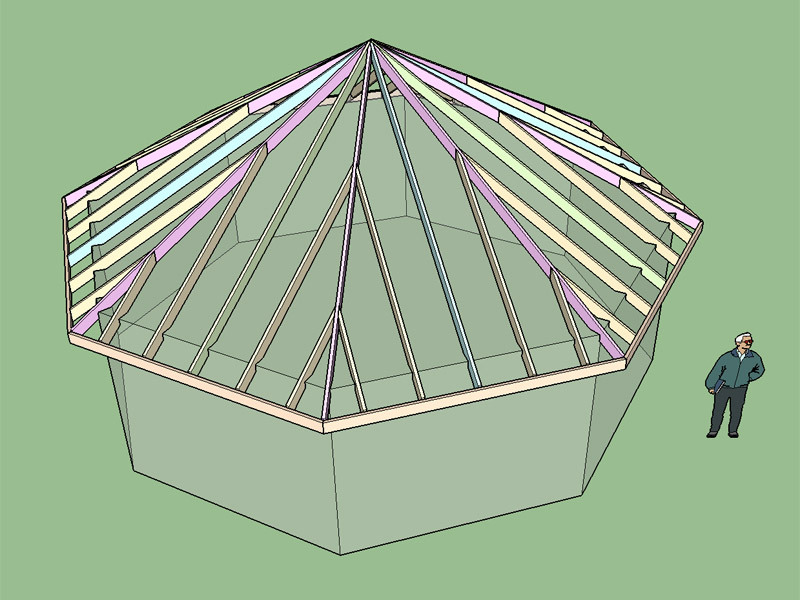 I prefer the method I have shown above because it is much easier to extrapolate the framing method to include elongated octagonal roofs. 8 common rafters and 8 hip rafters come together at the peak, seems like it would be a real pain to try and fasten these at the peak, perhaps someone could enlighten me on how a carpenter would actually put this together. 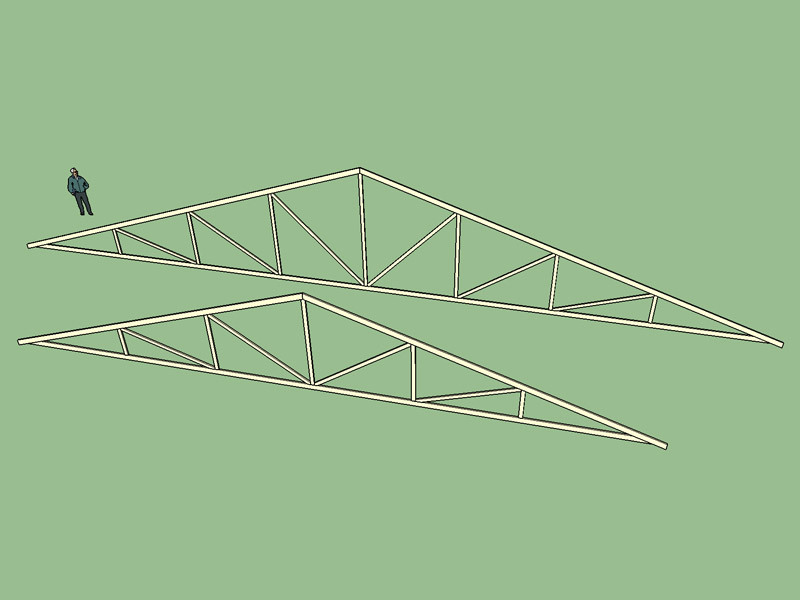 - Added Soffit Cut within Advanced Options for common fink truss type. 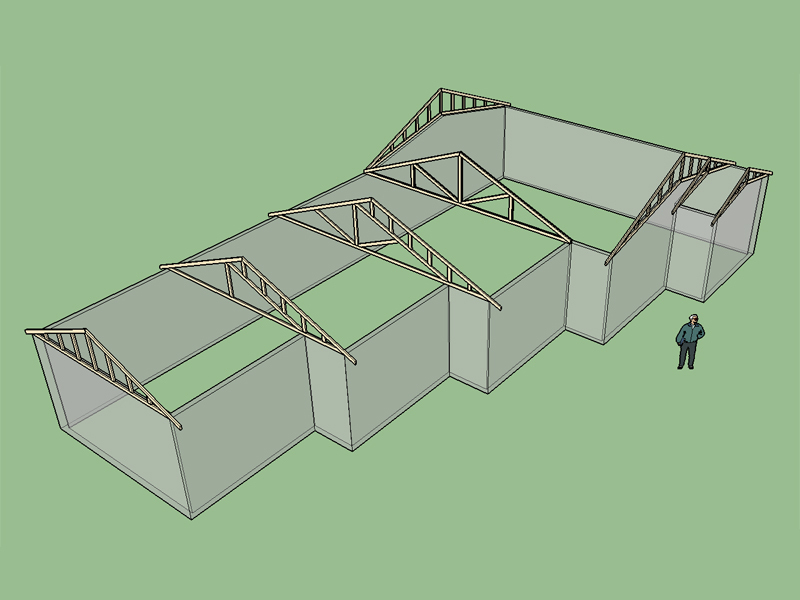 After I'm certain that this feature is robust I will add it to all other truss types and rafter roofs. 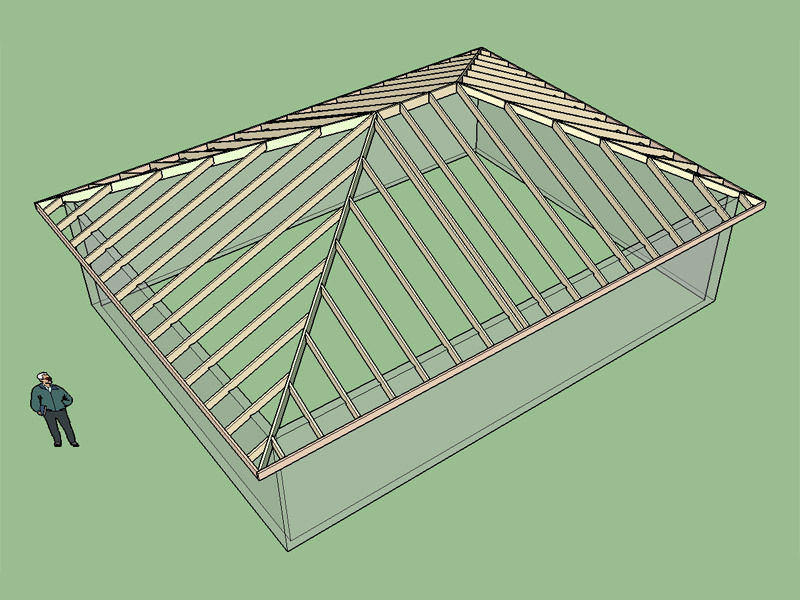 For now it only applies to roofs that use a common fink truss (non-raised heel). Are there any truss types I am missing that you would like to see added to the plugin? 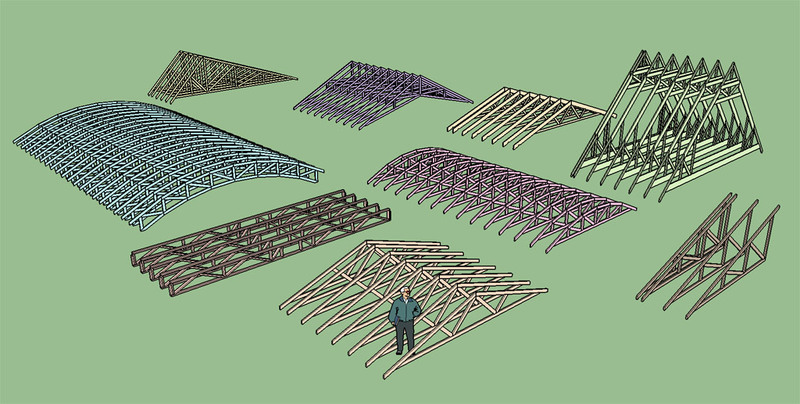 - Added Double Howe and Triple Howe common truss types. - Structural outlookers (vert. & horz.) 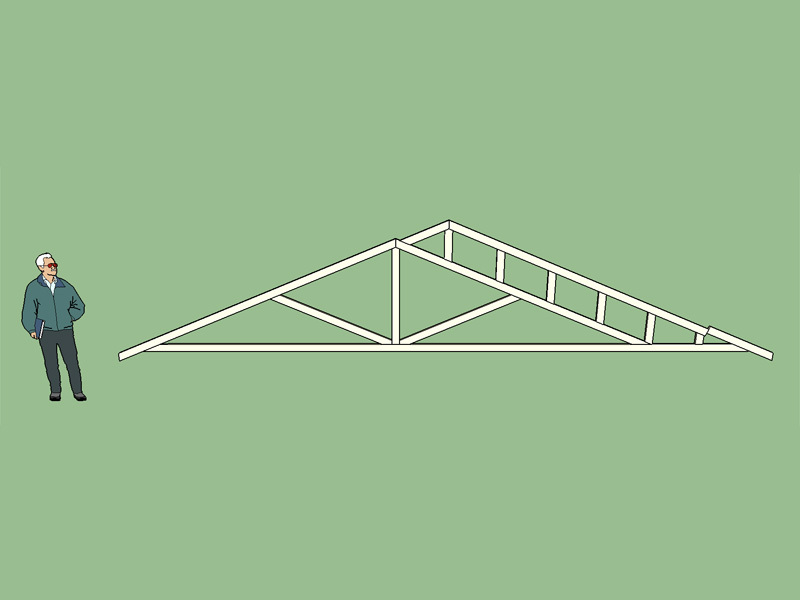 enabled under advanced roof options for Common (Double & Triple Howe) truss types. My time allotted to work on the plugin is very limited right now so I'm trying to decide if this would be something of interest for current and potential users of the plugin.